The China Chain Store & Franchise Association (CCFA) Chain Catering Committee and CCFA China Sustainable Consumption Round-table jointly launched the "Voluntary Action Plan of CCFA Chain Catering Enterprises on Food Waste Reduction Initiative”. The launch event on March 13, 2019 in Shanghai was witnessed and participated by 500 Chinese catering companies, with nearly 1400 people present. This event was supported by the Food and Agriculture Organization of the United Nations (FAO), the United Nations Environmental Programme (UN ENVIRONMENT), NET PLANET NETWORK, the IVL Swedish Environmental Research Institute, and the REFRESH project team. 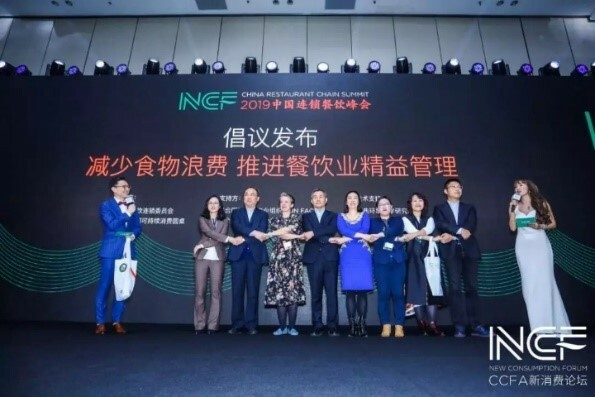 During the event, the participating representatives of relevant organizations, institutions and chain catering enterprises at home and abroad jointly issued an appeal to the Chinese catering industry, to reduce food waste and to raise the environmental responsibility of enterprises in the Chinese market. During the panel discussion, the chief representative of IVL Swedish Environmental Research Institute, Ms. Gao Si shared the EU experience on food waste reduction. IKEA China presented their smart scale solution on kitchen waste and Xibei Restaurant Group highlighted their pilot the lean management on food waste reduction in Beijing. Data showed that catering businesses that promote lean management of food waste and take innovative actions to reduce food waste, help to achieve a win-win situation between environmental responsibility and economic benefits. They also support sustainable development of safe and healthy food, increase efficiency and reduce greenhouse gas emissions. At the end of this event, the SAVE 12.3 platform announced the SAVE 12.3 Workshop on Catering Lean Management that will take place in Beijing in May 2019. The workshop has gained support from the Food and Agriculture Organization of the United Nations (FAO), the Corporate Social Responsibility (CSR) Center of the Swedish Embassy in China, and the European REFRESH project team.